of players and they cover the time period from 1750 to 2008. The games have been chosen from a wide range of openings, so there is something for everyone. 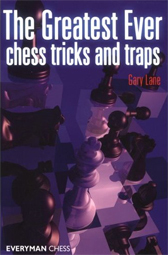 Lane writes that he “found it important to chose lines that, should the trap be spotted, one can carry on without fear of having a worse position.” He also notes that he made an effort “to find ancient ideas that still work in modern openings.” Along the way he offers practical tips, anecdotes, snippets of chess history, and hints on how to improve. 4 Flank Openings: 1 c4, 1 Nf3, etc. The chapter Classic Attacks contains “some common, winning ideas and how to apply them.” There are familiar names like The Greek Gift, Boden’s Mate, Pillsbury’s Mate, Morphy’s Concealed Mate, The Arabian Mate, Philidor’s Legacy, The Thornton Castling Trap, and Back Rank Checkmate. 1.e4 e5 2.Nf3 Nc6 3.Bc4 Nd4?! There is considerable annotation throughout the game. For example, what if 5.Bxf7+ instead of 5.Nxf7? There is also an extra diagram for this variation. This trap was given a score of six for surprise value, seven for risk, five for chance of success, and nine for reward. This trap was given a score (maximum of 10) of 6 for surprise value, 7 for risk, 5 for chance of success, and 9 for reward. At the end of the book there is an Index of Games as well as an Index of Openings. It was a disappointment not to find an index of common names for the traps, i.e., The Greek Gift, Legall’s Mate, etc. This is a fun book. The thought of springing one of these traps on an opponent or avoiding falling into one should be incentive to spend time studying the book and learning tactics in the opening. This book is recommended for anyone who wants to improve his/her chess game and have some fun doing it.